Anytime snow and ice are hitting the roads of CT, Herb Holden Trucking is open for business. We offer extended evening loading as well as early morning loading during snow and ice storms for selling road salt products. Open 56 Years and Growing! We founded this company in 1961 and have always operated our business honestly and fairly. Recently, people have been spreading rumors about us selling out. 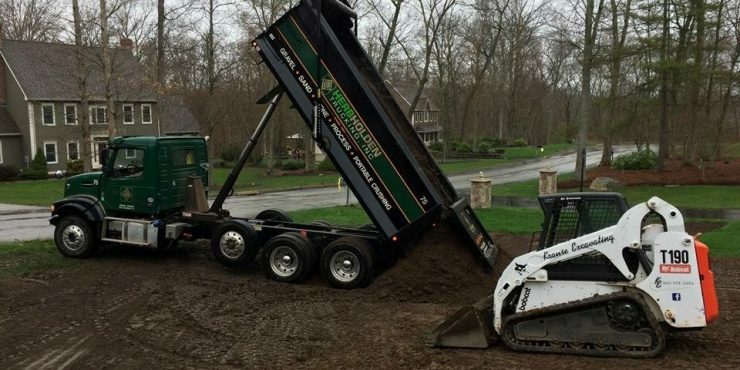 This is not how we oper ..
Order Your Topsoil Delivery Today Order any quantity, Monday-Saturday for same day delivery. Need help spreading it? We have a team of guys that can come out and grade your lawn or work area .. Centered in Hartford County, Connecticut, Herb Holden Trucking, Inc has been on the ground floor of all major development projects throughout Connecticut for almost 50 years. Our commitment to servicing our customers with the ever-changing landscape of the construction industry has accounted for much of our success. See how Herb Holden Trucking, Inc. can serve your project needs. Contact Us today!